How is this one? Let's put it to you this way, it is a complete one star-sky. Why? We cannot rate it any lower. Why? The bloke who designed the tech for this site is a socially backward dude with a wry, twisted sense of humor. Why? He doesn't get out much. Why? It's against the rules of his correctional facility. Why? Those guys at the facility are more Starsky than Hutch. Why? The world doesn't all look like Owen Wilson. If you are a woman, you must have noticed. Starsky (Ben Stiller) is a cop who is border-line-OCD kinda punctilious about his work; while Hutch (Owen Wilson) is the kinda cop who is perfectly content nudging a floating body further down the river so some other precinct would have to handle it. And we didn't make that up as a 'for instance', uh-umm… that's really how he wants to handle a floater that marks the start of this flick. The said floater leads the twosome to Feldman (Vince Vaughn) who is a law-abiding businessman by day and a drug lord by day. Yes, we said, 'by day'. We don't know what he does by night. And, truth be told, we do not want to, either. Starsky and Hutch have a reliable informant in Huggy Bear (Snoop Dogg), who plays the lovable pimp to perfection. In his fur coats and deafeningly loud jewelry he looks only less conspicuous than Starsky's Grand Torrino, a car that he uses when 'under cover'. Smart. Now, our boys know that Feldman is guilty as sin, but are having trouble proving it. Well, they are model cops. Just not working models. The whole deal is about some genetically modified coke that does not show up in tests, and goes undetected by sniffer dogs. Feldman is holding tons of that stuff with the intent to sell, and the awesome twosome must stop the deal from going down, generate funny while doing it, and set aside some special quality time to humiliate themselves, while at it. Sounds reasonable, doesn't it? Okay, time to up the medication. Starsky And Hutch has a few Baywatch hotties (Carmen Electra and Brande Rodericks), and with two hot-blooded males running around loose, there is obviously a lotta of chemistry. So, there they are, the two testosterone-loaded hunks going at each other. Really boys, we are glad you like each other so, but how about a quiet vacation for two instead of a public display of affection? 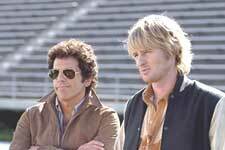 Starsky And Hutch does make for a few laughs in painfully few intermittent spurts. But for the most part, it looks like all scripting decisions have been made by putting 'inky pinky ponky' to good use. c'mon yaar, its a movie version of the hit 70's show. It sticks to the funda quite faithfully. So, if ur thinking of watching it for the comedy content, u'll be in for a not so good surprise. Never mind the casting of Ben Stiller/Owen Wilson, they actually make it work to some extent. Timepass movie..
fullhyd.com has 700,000+ monthly visits. Tell Hyderabad what you feel about Starsky And Hutch!